It starts with a brief review of the challenges preventing young agripreneurs from accessing needed finance. It went further to assess the current state of financing available to youth in agriculture, observing that financing youth in agriculture is already happening. Besides, where African youth have had this financing opportunity, they have found innovative and creative strategies to secure a future for themselves while contributing to the development of the private sector and social stability in their countries. However, because young people often have fewer assets to use as collaterals, there is still a considerable gap in their access finance especially through formal institutions, thus financing of youth in agriculture needs to be scaled up. Links between young entrepreneurs in agriculture and formal financial institutions need to be strengthened by improving youth’s financial literacy and the capability of institutions to assess agricultural sector opportunities. Better metrics can drive better policy – African governments should produce and share reliable statistics on youth employment in agriculture and their financial inclusion. Young agripreneurs, having fewer assets, will benefit from forms of finance that do not require fixed collateral, such as contract farming, leasing, warehouse receipt finance or factoring. Governments and international development organizations should encourage such forms of finance through blending and guarantee schemes. Crowdfunding platforms offer opportunities to young African entrepreneurs, including in agriculture, and governments should remove all barriers that prevent them from operating properly, including for equity and loan financing. A scarcity of venture capital firms (including the mentoring services that they provide) hampers African young entrepreneurs, including in agriculture, in developing and scaling up their businesses. Development organizations should continue to scale up their support for challenge funds and impact investing to fill this critical gap in the market. Leveraging on these recommendations can help governments and development organisations working with young people in agriculture to facilitate increased youth engagement in agriculture and unleash their entrepreneurship drive. In justifying the focus on youth, AGRA pointed out a post-launch press release on its website that: "Youth participation all along the value chain is vital to the growth of the agriculture-based economies of most African countries – from agricultural research and development, to food production, storage and handling, to agroprocessing, through to marketing and distribution in local, regional and international food markets. African youth present an unprecedented opportunity to deal with the constraints and challenges holding back improvements in agricultural productivity. Channeling the energy, strength, and dynamism of Africa’s youth into productive, competitive and profitable agribusinesses (including food production) will boost agricultural productivity, ensure sustainable food production system, create jobs, and generate incomes. The impact of youth involvement and participation in agriculture and food systems will be seen in sustainable economic growth, and in the reduction of poverty and malnutrition across the continent." 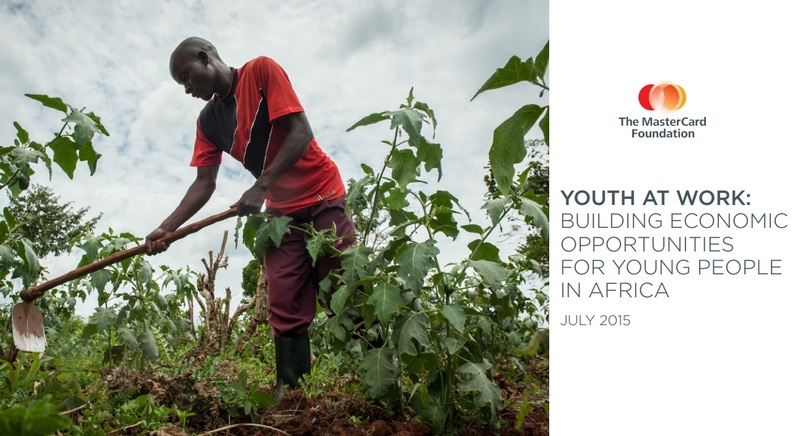 The chapter on "Innovative and Inclusive Finance for Youth in Agriculture" (chapter 4 in the report), highlighted the weak link between youth agripreneurs and formal financial institutions, including the scarcity of venture capital firms to support young entrepreneurs. It suggested alleviating these challenges for example through innovative financial means that required fewer or no assets or fixed collateral; such as contract farming, leasing, warehousing receipt, including socially innovative ways like crowdfunding. On the other hand, the chapter on "ICT and Youth in Agriculture" (chapter 5) explored ICT for agriculture status and trends in Africa, and examined the roles ICTs are playing in supporting youth involvement in the sector. It also illustrated how youth are contributing to strengthening agricultural value chains through ICT innovations. It finallly discussed the current challenges relating to ICT use by youth (agricultural entrepreneurs, ICT entrepreneurs venturing in agriculture or other youth active in the sector) and suggested ways that those problems can be resolved. In the end, as also expressed in the release quoted earlier, "the report is an affirmation and recognition of the prominent role of youth in transforming SSA agriculture and their vital contribution to engendering a uniquely African green revolution. Youth are vital to development and growth across Africa. The hope is that all stakeholders – whether from the public or private sector, or from government or non-governmental organizations working to transform African agriculture – will recognize the importance and potential of Africa’s youth and wisely invest in them to reduce poverty, end hunger, and ensure healthy lives and wellbeing for all at all ages." For the vast majority of youth, “mixed livelihoods” too often result in barely subsistence wages, and with little protection and security. The MasterCard Foundation’s programs have sought to address these issues by pushing forward more holistic, comprehensive training programs, which offer a combination of training for market-relevant skills, the connection to stable jobs or more productive self-employment opportunities, and development of fundamental life skills, including appropriate financial education and services. But looking at the other side of the picture, there are many young people already involved in family farming. By undertaking their daily tasks, they acquire knowledge and skills from their elderly family members and apply these techniques in their farming activities. They also bring agricultural technology and innovation into the family farm and are often involved in management activities that require their educational knowledge (keeping accounts, communication with partners, etc.). There is also another category of youth who are not directly involved in the field, but are developing ICT applications or offering ICT services which are useful to family farmers. These are some of the key features of youth in family farming, that are highlighted in the report of the e-debate on “Youth sustaining family farming through ICTs”, organised by the Technical Centre for Agricultural and Rural Cooperation (CTA), in collaboration with the African Youth Foundation (AYF) in October 2014. Aiming to discuss the involvement of youth in family farming, opportunities in this area and challenges faced; as well as exploring how ICTs can strengthen their engagement in family farming, this e-debate has generated over 150 contributions from more than 20 countries. The discussions stressed that enhancing youth engagement in family farming will require further support to rural youth, as well as improving rural conditions. The debate also recalled that family farming facilitates entry in the agricultural sector. Sustaining family farming will therefore result in an increase in youth involvement in agriculture. Other interesting points raised by participants are the need to develop agribusiness capacity for young family farmers and to ensure that ICT solutions targeting farming and rural stakeholders are more adapted to rural socio-technical contexts. Local content is key and will accelerate adoption of ICTs by family farmers. The report includes a great number of initiatives shared by youth and organisations supporting youths during the discussion. The e-debate was organised in the context of the International Year of Family Farming, and in the framework of the ARDYIS project’s periodic e-debates. These exchanges are organised notably to support knowledge building of young people on ICT for agriculture issues and favour networking. Subject matter experts from IFAD, Savannah Young Farmers Network, MEDIAPROD, Caribbean Agricultural Extension Provider's Network (CAEPNet), CTA, University of the West Indies and AYF contributed to the facilitation of the discussions. On the occasion of the 2014 World Food Day, the MasterCard Foundation released a new working paper on "Agribusiness in Sub-Saharan Africa: Pathways for developing innovative programs for youth and the rural poor". This paper is intended to provide guidance for those seeking impact in the field of agriculture and youth development in Africa. It defines key terms and concepts, and highlights promising initiatives and projects that develop durable livelihood opportunities for young people working in agriculture. Contribute to the celebration of the International Girls in ICT Day. The discussion witnessed participation from the members subscribed on the discussion group. At the time of the e-debate, over 500 people were subscribed to the mailing list. The different contributions came from Benin, Burkina Faso, Cameroon, Dominica, D.R. Congo, Ghana, Jamaica, Kenya, Madagascar, Malawi, Mali, Mauritius, Nigeria, Tanzania, The Netherlands, Trinidad and Tobago, United Kingdom, Uganda and Zambia.